This researcher is using HPWREN to upload data collected in the field to her laboratory. Her laptop requires no external power or equipment, other than the connecting PCMCIA card and a tripod-mounted antenna. All three disciplines share the common problem of transmitting information from remote field sites to campus laboratories (and vice versa). 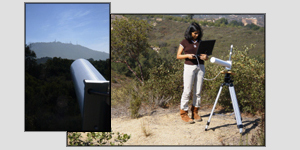 But, HPWREN allows field researchers in remote San Diego county to efficiently transmit real-time data! Implementing real-time access to earthquake sensors in the east San Diego desert is a challenge, however, this access will no longer be impossible - thanks to the advancements in wireless technology. The HPWREN project is currently working to expand and improve existing wireless links in remote seismic field locations to ensure that the sensors are adequately configured to withstand a catastrophic seismic event. 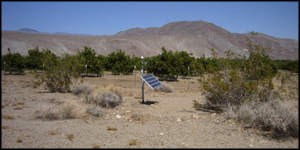 Most recently, the HPWREN and ROADNet teams collaborated to provide two southern California research sites with a broadband network link and an interface to real-time strainmeter data. That is, scientists from around the world can now access real-time long-base strainmeter data recorded at the Piñon Flat Observatory and Durmid Hill sites, which are both managed by the Cecil H. and Ida M. Green Institute of Geophysics and Planetary Physics (IGPP) at the Scripps Institution of Oceanography (SIO). Additionally, HPWREN researchers wrote and implemented software that utilizes SIO's IGPP's existing seismic sensor network to distribute real-time data to client computers. Real-time distribution of seismic data is now available via HPWREN Mquake. For additional information about seismology applications utilizing HPWREN connectivity, please refer to http://hpwren.ucsd.edu/news/030606.html, http://hpwren.ucsd.edu/news/030105.html, http://hpwren.ucsd.edu/news/020905.html, http://hpwren.ucsd.edu/news/011115.html, and http://hpwren.ucsd.edu/news/010124.html. Situated at an elevation of about 6100 feet, San Diego State University's Mount Laguna Observatory (MLO) is 35 air miles from the SDSU campus (on a direct line of sight) and 45 miles from metropolitan San Diego. With telescopes that achieve maximum resolution, an astronomer at the observatory typically generates 200 images on a long winter night. 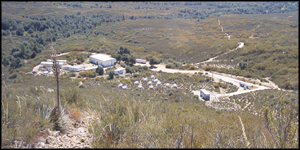 In order to transfer the data from Mount Laguna to on-campus facilities, digital audio tapes (DATs) are currently used; however, high-speed Internet access opens up a world of opportunities for the MLO astronomers. One such opportunity includes the ability for the astronomers to quickly transfer files from the observatory telescopes to their laboratories and/or classrooms. Another possibile application is the transfer of real-time data from the observatory to the Reuben H. Fleet Science Center (located in San Diego's Balboa Park). 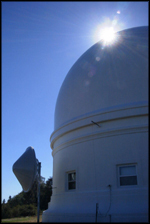 For more information regarding Mount Laguna Observatory's HPWREN connectivity, please refer to http://hpwren.ucsd.edu/news/010502.html and http://hpwren.ucsd.edu/news/001213.html. The HPWREN Photo Gallery also has several photographs depicting the work at MLO; see http://hpwren.ucsd.edu/Photos/sites.html#Laguna for details. In addition to the MLO connection, the HPWREN team also connected the Palomar Observatory to its 45 Mbps backbone. Coupled with the 48-inch Oschin telescope's sophisticated digital camera, the high-speed network connection allows researchers to transmit real-time images directly from the observatory to worldwide astronomy laboratories. The images are primarily used for near-Earth asteroid research and supernova detection. 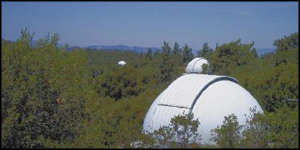 Information regarding the HPWREN/Palomar Observatory collaboration can be found at http://hpwren.ucsd.edu/news/030619.html, http://hpwren.ucsd.edu/news/030107.html, http://hpwren.ucsd.edu/news/010801.html. Several photographs are also available at http://hpwren.ucsd.edu/Photos/sites.html#PO. San Diego State University's 4344-acre Santa Margarita Ecological Reserve (SMER) was recently connected to the HPWREN 45 Mbps backbone. Reserve field scientists now have the capability of sending and receiving data at a speed of 45 megabits per second! The primary benefit of the connectivity includes the availability for researchers to employ high-bandwidth instruments such as imaging systems used to measure and monitor ecological and environmental systems as well as to extend the number and range of conventional remote sensing devices in the terrestrial and aquatic domains. For instance, one SMER researcher uses the HPWREN connectivity to remotely observe hummingbirds, bees, and moths in the pollination of bush monkey flower, Mimulus aurantiacus. Please refer to http://hpwren.ucsd.edu/news/020415.html for details. Prior to deploying the 45 Mbps connection, the HPWREN team participated in a wireless demonstration at SMER. The activity connected four points within the reserve to demonstrate several new techniques for gathering environmental data via wireless technology. For more information regarding the demonstration, please refer to http://hpwren.ucsd.edu/news/010425.html. Plans are also underway to connect the 1600-acre Sky Oaks Field Station to HPWREN. 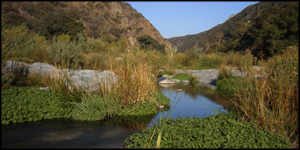 The San Diego State Field Stations Program also runs the Fortuna Mountain Research Reserve and the Tijuana River National Estuarine Research Reserve. Additional photographs of the SDSU ecological reserves can be seen at http://hpwren.ucsd.edu/Photos/sites.html#SMER and http://hpwren.ucsd.edu/Photos/sites.html#Sky.